What is Taiwan Tech (National Taiwan University of Science and Technology) & The COMMATRIX? The COMMATRIX (Advanced Design Center) was founded to serve as a core energy for the international award-winning Industrial and Commercial Design Department (ICD) at the National Taiwan University and Science and technology (Taiwan Tech). The COMMATRIX also has considerable influences over the future development of Taiwan's cultural and creative industries as a mainstream design platform connecting design institutes and industries. The main missions and services of the COMMATRIX include integrated marketing and services design, art that interacts with technology, design perceptual awareness Lab (D:PAL), healthy living design for the elderly, the development of smart platform applications system, commercialization of research patents and IP, and the Journal of Technology (Ei indexed). It is equipped with the most-updated design library for students and professionals, allowing it to become an important international interactive platform for design departments in Taiwan. Taiwan Tech has won the "The Aim for the Top University Plan" campaign 10 times in a row, and is recognized by the Ministry of Education in the Top 12 Universities among all colleges and universities in Taiwan. According to the Times Higher Education’s list of the world’s top universities for 2012-13, Taiwan Tech was ranked No.351-400 in the world (No.6 in Taiwan), and No.56 in Asia (No.5 in Taiwan). In a 2011 survey of “University Evaluation” by Global View (a monthly magazine in technology most read by designers in Taiwan) and the 104 Job Bank (the biggest and most credited online job engine in Taiwan), Taiwan Tech was ranked No.4 in the country; in an survey of “Graduate Students Most Favored by Corporations" Taiwan Tech graduates were ranked No.5 in the country. It also ranked No. 1 in the "Highest Graduates Employment Rate of all National Technical Colleges in Taiwan", a survey carried out by Business Weekly (Top Business Magazine in Taiwan) and the 104 Job Bank. Taiwan Tech has also worked closely with some of the top corporations in Taiwan under a total funding of nearly 900 million (NTD) for industrial collaboration - over one-third of the university's expenditure in total. ICD professors and students have performed excellently in the field of creative design, making Taiwan Tech No.1 in the ranking of various top international design awards such as iF(Germany) and Red Dot (since 2011). Within a short time from 2002 to present, the department has already accumulated more than 400 awards from many international competitions such as SIGGRAPH(USA), ANNECY, Austria’s Prix Ars Electronica.., etc., leading its way ahead of all design departments in Taiwan. Each professor at ICD publishes more than 10 journal papers each year in various domestic and foreign journals by taking part in various Industry-Academy projects. The outstanding achievements and expertise and of the department are weighted equally on both practical design and academic levels. The SDW Committee is made up of expertise from various academic and industrial organizations, including the Commatrix, Department of Industrial and Commercial Design (ICD) and the Taiwan Building Technology Center of the National Taiwan University of Science and Technology (Taiwan Tech), PEGA D&E, and Asia Design Assembly (ADA), which consists of 3 biggest design associations across Asia - Chinese Industrial Designers Association (CIDA), Japan Industrial Designers Association (JIDA) and Korea Association of Industrial Designers (KAID). Specializing in Neurology Marketing and Advertising Design, Brand Perception Design, Integrated Marketing Design of Communications, Product Packaging Design and the Design for Elderly Consumers, Dr. Wang is keen on developing a platform between academics and the industry. Students led by Dr. Wang have won many international awards in design over the past few years, including Reddot/best of best, iF (Germany), D&AD(UK), Annecy(France), I CASTELLI ANIMATI(Italy), NYC ACM Siggraph, ACM Siggraph Space-Time(USA). With over 120 papers published in national and international journals, Dr. Wang also owns various patents, and had commanded a significant no. of projects (over one million USD in expenditure) organized under the Industry-Academy Cooperation Scheme of the Ministry of Education, R.O.C. Director of industrial design center, Pegatron Corp.
After a long career in Acer and Elan Vital D&M, Debbie joined ASUS in 2000 and became the very first member of its Industrial Design Division. ASUS had grown immensely under Debbie's professional guidance, while industrial designing has prospered immensely from what used to be a very primitive concept in Taiwan to practically inevitable in every technology company . 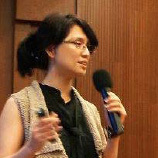 In 2008, Debbie embarked on a brand new, exciting journey of design in PEGA D&E, leading hundreds of designers and researchers for more innovations and creations in its three major design centers (Taipei, Shanghai and Beijing). Christian Guellerin is President of Cumulus, the International Association of Universities and Schools of Design, Art and Media. Cumulus represents 189 schools of design, art and media in 46 countries. Christian Guellerin is also the Executive Director of the Ecole de design Nantes Atlantique, which aims to train professionals for the creation and innovation for socio-economic development. Design is understood as an opportunity to generate added value and progress. Professor Albert Ng is an award‐winning instructor at York University. Albert's research interests include areas of design and culture, and accreditation. He has been involved with a broad range of professional undertakings, including serving as the vice‐president of the International Council of Graphic Design Associations (Icograda). Icograda was founded in 1963 with the mission to promote design in terms of thinking (thoughts), education, research and policy. It currently has over 200 members (design schools, studios..., etc.) from 67 countries. Albert was also the first president of the Association of Registered Graphic Designers of Ontario. Taipei is the capital and largest city of Taiwan. Located at the northern tip of the Formosa island, the city is the political, cultural and economical center of Taiwan. As an international city, Taipei is full of diversity and foreign visitors. It is famous for its culinary master pieces, from the streets of different night markets to world class restaurants. Nestled in the center of the Taipei Basin, Taipei City is surrounded by mountains ranging from the north, east and south, and by Danshui River in the west (with many visitors travelled a long way only to see the sunset beside it on a daily basis). As a result of such distinctive geographical features, it is endowed with unique natural scenery, with lush forests, winding rivers, and a variety of fascinating terrains including volcanic mountains, foothills, terrace tablelands, coastal plains and river wetlands. In addition to the beautiful sceneries, Taipei is also an exciting city for individuals who enjoy indulging themselves in shopping, great dining, exotic night life and feasts of arts and culture. The National Palace Museum (Chinese: 國立故宮博物院 Guólì Gùgōng Bówùyuàn) is an art museum in Taipei City, Taiwan. It is the national museum of the Republic of China, and has a permanent collection of 693,507 pieces of ancient Chinese artifacts and artworks, making it one of the largest in the world. The collection encompasses over 8,000 years of Chinese history from the Neolithic age to the late Qing Dynasty (Thirteen years after the founding of the Republic of China, the last Qing Emperor Puyi was exiled from the Forbidden City. The cultural artifacts left within the palaces were collectively itemized, which led to the birth of the National Palace Museum). Most of the collection in the palace are high quality pieces collected by China's ancient emperors. The enormous variety of typical Taiwanese snacks is unique in the world and most perfectly illustrates the important place that food/eating culture takes into the lives of Taiwanese people. Famous and unique Taiwanese snacks range from oyster omelets to fried rice noodles, tempura, Tainan Danzai noodles, Taiwanese spring rolls, rice tube pudding, and braised pork rice..., etc. - just to name a few! Food here is delicious and cheap compared to many parts of the world, but by no means inferior. Each specialty gives you a foreign and exciting culinary experience, along with an insight into the people of the area the food originates from. Taiwanese snacks can be found almost everywhere in every street/road, but it is the different traditions of each Taiwan's night market where you can taste their uniqueness and characteristics. They (Night markets) are also the places where you can find all the delicacy in abundance with ease and fun! All students attending SDW 2013 are eligible for air tickets (Economic Class, Return) reimbursement. Depending on the country of departure (which refers to the country of the student's university), the amount reimbursed may vary but no more than Table 1 below. Please book your air ticket in advance in order to avoid busy summer flying season. If you are unable to book a ticket below the prices in Table 1 please inform SDW before May 10, 2013 so that we can try our best to cover the costs. After May 10, we will reimburse your ticket based on the prices below, with limited adjustment. To request your reimbursement, please arrange to have copies of all the following documents for SDW on Aug 6, 2013. All reimbursement will be paid in cash (NTD) on Aug 10, 2013. A design competition will be held during the course of the workshop. Winning groups will be awarded with the following amounts respectively in cash (NTD). All students attending SDW 2013 are offered free accommodation at Howard Hotels between Aug 5~Aug 11 (6 nights). There will be 2 types of room, one with 4 single beds and one with 2 single beds. For the 4-bed room, there is a small partition in the middle (2 beds on each side). In either (2-bed / 4 bed) type of room there is a (one) bathroom for sharing. Students of same gender will be placed in one room. No.30, Sec. 3, Xinsheng S. Rd., Da’an Dist., Taipei City 106, Taiwan. Students are allowed to check-in after 15:30 on Aug 5, 2013, but if you are arriving at the Taoyuan International Airport around 13:30 on Aug 5 you may join other SDW students and go to the hotel together (see airport pickup info below). Note: SDW is only responsible for student accommodation between Aug 5-11 (6 nights). Please make sure to arrange and pay for your own accommodation if you are in Taiwan before Aug 5 and/or after Aug 11. 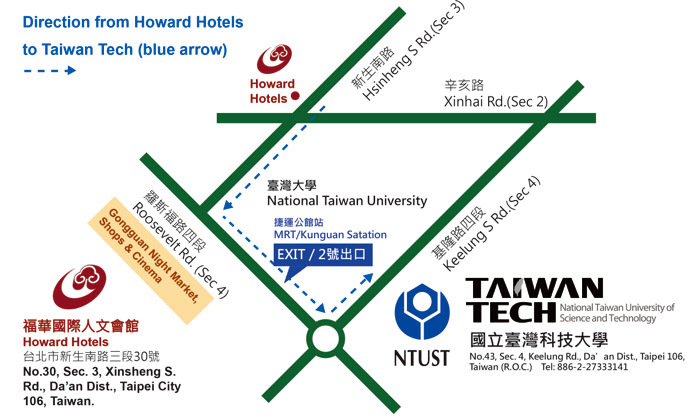 Howard Hotels in located in the heart of Taipei City, which is 20-30 min away from Taiwan Tech by MRT/bus, 30-40 min by foot. Turn left when you come out of Howard Hotels, walk straight (Xinsheng S. Rd.) for 8-10 min until you arrive at the big intersection (next to National Taiwan University). Turn left onto Roosevelt Rd. and keep walking. You will pass the Gongguan MRT station in 3-5 min. Keep going for 7-10 min until you see another intersection (under the highway). Cross the road to the opposite side and turn left immediately onto Keelung Road. Keep walking for another 5-8 min and you can see Taiwan Tech on your right (after the first crossing). Students who wish to take the bus on their own can go to the Bus Station directly, which is located at the other side of the greeting hall. If you are arriving in Airport Terminal 1, you can take the skytrain or airport shuttle bus from T1 to T2 to meet the group, or you can purchase your own bus ticket and board directly at the bus station in T1. The bus journey takes 45-60 min from airport to Taipei City, depending on the flow of traffic. Detailed floor map of both Airport T1 and T2 is enclosed for your reference. Note: Please inform us before May 30 if you need airport pickup. If we don't receive your email before May 30 we will assume that you are checking-in to the hotel by your own means (transportation).